I’m guessing the majority of people reading this are high school students, so I’m going to start this off by saying being a teenager is stressful. However it is completely normal for it to be this way, and I would call you crazy if you said you’ve never been stressed out or at least a little inconvenienced by all the things high school and life at this age brings. You’ve got homework, extracurriculars, work, upcoming tests, peer pressure, not enough sleep and the list could keep going and going for some. However, these stressors should not lead you to act rudely towards others. 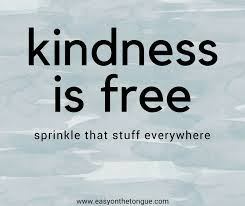 With saying that, after I did some research I found that being kind has scientifically proven benefits. Have you ever been told that being kind is contagious? Well, kindness IS contagious, literally. It has been proven that if someone is treated unexpectedly well by a single person, their mood is significantly improved and they are more likely to spread it on. Being said, if you are kind to others/do a good deed, others who see this are much more likely to pass on the vibes and you have suddenly created a domino effect on dozens of people you never thought you would. Moving forward, being kind can actually help a person not be so stressed out. This is perfect, right? High school students who are surrounded by hundreds of kids every day can be less stressed out just by simply being kind. The proof lies in the fact that kind people have 23% less cortisol (which is the stress hormone) and age slower than the average population! Not only is being kind fun, but it can actually increase your lifespan. It is said that helping others with random acts of kindness protects overall health twice as much as aspirin protects against heart disease. Also people who are 55 and older who volunteer and do kind acts have a 44% lower chance of dying early. Okay, at this point if you don’t agree to be kind, then I don’t know what to tell you, you can literally decrease your own and other people’s risk of having heart disease. Plus, there are many other benefits to being nice to people, like the sole fact that it makes you and the other people affected feel good. So the next time you have a choice to treat a person nice, remember that there is no choice, be kind because it could possibly make you live longer. If you would like to read more about this, I’ve linked the website here where I got all of my information and benefits on kindness.